Caitlin and Brittany they ain’t. War Eagle? Whether by degree or by logo or both, Auburn has certainly staked its claim in reality television over the past few years. But represented (one way or another) in back-to-back seasons of The Amazing Race? Who’d have thunk? We knew from early promotional photos that a Bama fan, possibly history’s greatest, aesthetically speaking, was on the new cast. 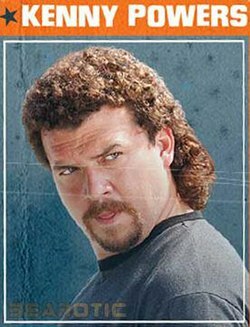 His name is Kenny Powers Chuck and he’s a taxidermist from Daphne. 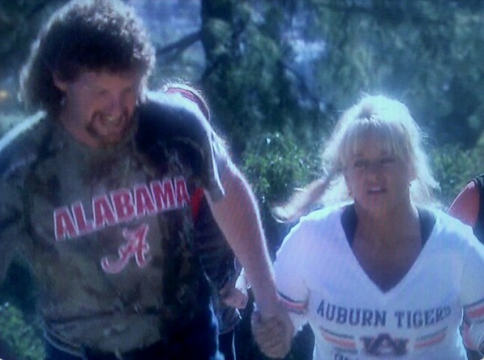 Turns out his cosmetologist / hairdresser wife Wynona, who he won’t allow to cut his mullet (for obvious, Platonically permed ‘n’ perfect reasons) is an Auburn fan, or at least she’s sporting an Auburn shirt while running alongside Chuck and his Bama camo tee in the opening shots of the show. It’s like the Katherine Webb Sports Illustrated Swimsuit Issue photo shoot of reality show “Auburn” spottings. And they made it through the first episode. Buckle up. Eagle Eye Awards to @LonelyTailgater, @PhillipCWDE. Related: Auburn roots on ‘The Amazing Race’ trace back to (a single episode in) 2009.